[Carta executoria de hidalguia]. Granada, Spain, 20 June, 1522. 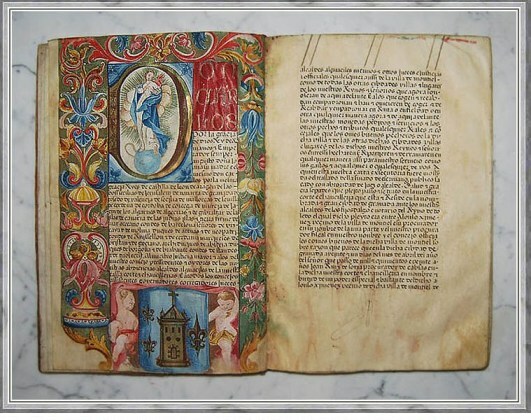 Illuminated manuscript on parchment. 41 leaves. 31.5 x 21 cm. Single column of 35 lines in brown ink, each leaf ruled in pale red. An early grant of nobility in favor of Alonso Ximenes by Holy Roman Emperor, Charles V. The richly illuminated salutatory leaf is worked in the typical grand style of the early sixteenth-century carta executoria, with the initial "D" in "Don Carlos" worked in gold, enclosing a miniature of the Virgin Mary standing upon the world, with a serpent circled beneath her. The page is surrounded on three sides by a floral border worked in reds, pinks, greens, blues, yellows and ochres against a ground of gold. In the lower panel, two cherubim flank the Seal of the Holy Roman Emperor. Scattered throughout the text are eighteen decorated initials worked in gold on backgrounds of pink, blue and burnt umber. On the verso of the final leaf the Chief Counsel drew a penwork seal -- the seal of the Holy Roman Emperor. This volume is written in a Gothic rotunda and bound in contemporary silk velvet over boards. Carta executoria both established noble lineage and served as tangible evidence of nobility, which had tremendously practical implications beyond social standing. During the early modern period in Spain the nobility and the clergy formed an estate far removed from the rest of the population. The property of the nobility was exempt from taxation and protected from civil suits. Nobles could not be imprisoned for indebtedness, or tortured (except for treason), and if sentenced to execution had the option of decapitation rather than hanging. The proportion of the population which could make a claim to nobility varied by geography – in the north as much as fifty percent of the inhabitants could claim noble blood, whereas in the recently conquered south, the nobility was no more than one percent of the population.